Hello, everyone, we have covered the processes I use to clean and protect the existing finish. We have worked our way through a gummed up sticky machine and acknowledged we need to be aware that thread nests can and do lock machines up. 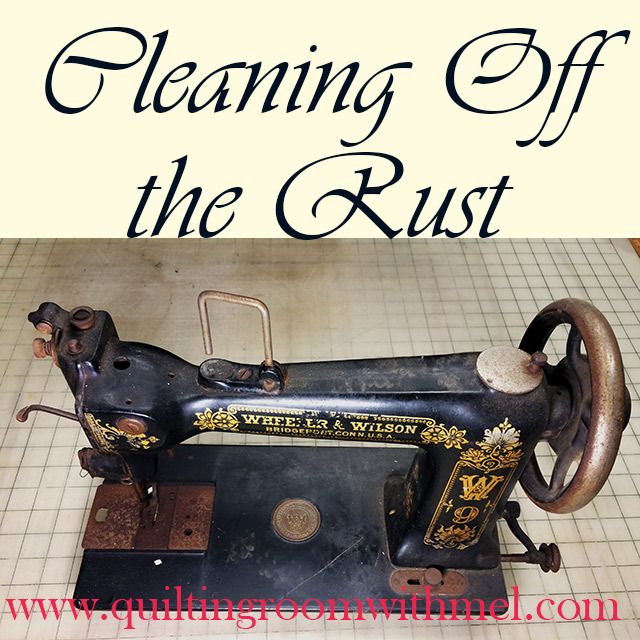 So today we are going to work our way through how we go about bringing a rusted stuck sewing machine back from the junk pile and making it leave stitches behind the needle once again. Why when there were millions of sewing machines made between the late 18 hundreds and now would anyone in their right mind want to revive a rusted old machine? Well, sometimes it is because there was a limited number of a particular model produced and finding one in any shape is nearly impossible. Or maybe it’s all about the challenge of bringing one of the old mechanical beauties back to life again. I don’t want to try to explain what drives the insanity that persuades us to resurrect or even restore these forgotten remnants of history. For me, it’s a little of all the above and a little more. I am intrigued by the mechanical aspect of the sewing machine and I find them fascinating to watch. I like hands on craftsmanship and constructing my own designs. So when I take a rusted old sewing machine from the junk pile and turn it back into a functional piece of equipment I have only fulfilled part of my journey with that machine. When I take that machine and use it to make a quilt or some other project then I have fulfilled that machines journey back into service and temporarily satisfied my artistic desire to do something creative. Ok back on topic now, Busting the rust. It's important to remember that after we determine what we need to do to protect whatever finish is left on the body of the machine and we have located any plastic parts that may or may not be affected by cleaners the rest of the machine is metal of some sort, and if it rusted, Its cast iron, tin or steel. There may be some brass/copper and aluminum involved, aluminum oxidizes and brass/copper will corrode but these metals rarely fuse together when they corrode and a good cleaning with a wire brush will generally allow movement again after the corrosion chunks are physically removed and lubrication is applied. Rust, however, will fuse ferrous metals together over a long period of time. In extreme situations this fusing is almost as strong as some welds, making it almost impossible at times to free moving parts. But with patience and persistence, it can be done. When we are dealing with a rust frozen machine the first thing we want to do is remove the needle plate, slide cover, inspection plates and when possible, the nose cone. Then remove as much rust from the surfaces as possible. Steel wool and various wire brushes generally solve this problem. Dremel tool and similar rotary tools capable of holding small wire brushes work very well to do this but aware of your environment when you use these tools as they do shed their bristles. So not only is it important to have on safety glasses or face shields and a body apron with a set of sleeves, keep in mind that gravity will eventually pull those bristles to the floor no matter how far they fly first. And because of that reason most of my wire brush work is done by hand. Even though it still sheds bristles containment of said bristles is easier. Once we’ve knocked all the surfaces down we try to wiggle a little movement by using the hand wheel .if we get some movement then we look for the area the movement stops. Everything associated with movement in that area is surveyed and scrutinized and then penetrating oils are used to drown all the rust mites. I apply rust busting oil very liberally and I really don’t care if it drips off onto the cardboard under the machine. I use cardboard just for that reason, It absorbs the oil drips and the drips are carrying away rust from the machine. One thing I should elaborate on, I work on project machines inside our living space when they are not extremely difficult to deal with. I use different penetrating oil in my living space than I do when I work outside or in the garage. Constant exposure to odors tends to bring me migraines. Perfumes, colognes, room deodorizers, fragrant soap all cause migraines for me after a couple hours. So once again be thoughtful of your environmental workspace and those who share it with you. If no movement can be noticed initially then I spray everything that has a pivot point or a bearing surface of any type. Especially the bearing points along shafts such as the needle bar, presser foot, and the hook carrier shaft. Don’t forget the main shaft ends where they ride through the machine body, main shaft bearings where pertinent and the pushrod bearings on each end. Allow some time for the oil to penetrate and start the wiggle and shake process all over again. Remember it didn’t get this way overnight so it may not loosen up instantly so at this point we are just watching for any signs of movement. Be patient and allow the oil to work. Heat can be applied to this process just as it was done with the gummy machines. Only this time it will likely cause smoke and you will want to concentrate the heat to the bearing surface only as much as possible. The heat does two things to help to free the machine, first it will expand the metal slightly but it also thins the oil when it is applied to the heated bearing. This allows better penetration of the lubricating properties of the oil. It doesn’t need to be red-hot for this process to work. But it is one of the processes best saved for out of the living space. Tapping lightly on a steel punch pressed against the end of the shafts will sometimes help to vibrate the rust seal and cause it to open up and allow penetrating oil enter. Use a flat ended punch, not a center punch or a chisel we don’t want to cause the shaft to expand by driving a point into it. We also don’t want to mushroom or swell the shaft end. Light solid taps set up vibrations and cause cracks. Heavy blows will knock things loose but they will also drive shafts and bearings into places they don’t belong and out of the areas they do. As well as bending smashing and swelling shafts and joints. Don’t use a heavy blow. Faster isn’t always better. I personally have never tried soaking a machine in kerosene although there are others who would swear it is the best way to free up a machine. I have always been leery of damage to the decals and or the enamel finish on the machine. I have soaked other mechanical projects and will admit great success and as such if I was willing to risk the finish and paint I am sure soaking would work just fine, after all, it is just steel gears shafts and bearings. Regardless of how you do it gaining motion is the desired effect. As soon as you start seeing movement it becomes a ritualistic process in which we push our movement to the limits both directions slowly gaining in distance. Flush the moving surfaces with penetrating oil let it drip off and continue to rock the movement to its extreme limits. Eventually, this will yield enough movement to become a rotation and from here it is all downhill. Having reached the point of a full rotation now it is simply the repetition of motion and oiling flush out the old by adding new and repeat. Once the machine is spinning free it becomes a simple clean up and polish job. Treat it like you would any other machine that needs a good oiling. At this point in time, I would usually clean it and wipe it all down with something a little cleaner based than SMO. I like to use Marvel oil to flush the bearings shortly thereafter switch to SMO to flush out the Marvel. This outlines the process I use when tackling a frozen machine. I don’t claim it to be the best; there are others who may have a different way to reach the same end results. And after all the end results are the only things that truly matters. An old machine resurrected from the bone yard, sewing like it was meant to and being loved by someone. Seeing the smiles of the user is the reward gained for a job well done and a huge test of patience. So until next time may your fabric never be wrinkled when the Iron refuses to heat. Wow, GREAT tips, thank you! I am still trying to talk a quilt shop owner out of an old hand crank Singer which languishes as a display. All rusty and needing love. 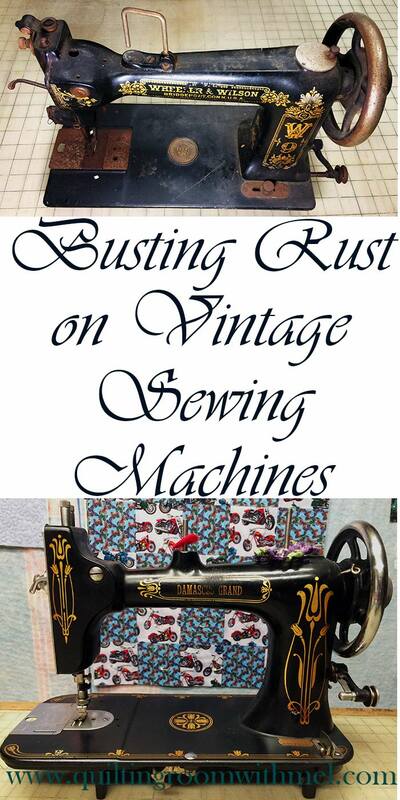 If you want old sewing machines, and you can find them without a lot of the rust, go to e-bay. I have three 1800's model machines, and several I've de-rusted. It's not that hard, and you learn more as you do more. Ah! Just like quilting!